Dave and I began teaching people to dance in 1996, but started in exactly the same way as our pupils by going to weekly dance lessons. Beginning with Rock 'n' Roll under the expert tuition of Bill Heron in the early nineties, we soon found we enjoyed the whole dance scene so much that we wanted to learn other styles, and went on to take regular lessons in Argentine Tango, Ballroom & Latin, and go to as many workshops and tasters as we could in other dances such as Lindy Hop & Salsa. We were asked to take over running, and teaching at, a Rock 'n' Roll club in Hayes in 1997, and later that year Bill Heron invited us to go into partnership with him, hence BJ's was formed. A long and happy association saw BJ's running Jive, Latin and Ballroom classes in Maidenhead, Bracknell, Reading and Sherfield, as well as many one-off workshops all over the South of England. We introduced Wedding 1st dances into the mix in 1999, and over the last 19 years have taught scores of happy couples to dance to just about every style of music you could think of. In the summer of 2009 we decided to give the classes a makeover - new name and new feel, while keeping the fundamentals of good solid learning in a fun environment. We had a great response to our summer survey, asking past and present class members for their views, and incorporated as much as we could of your ideas into the current class format. 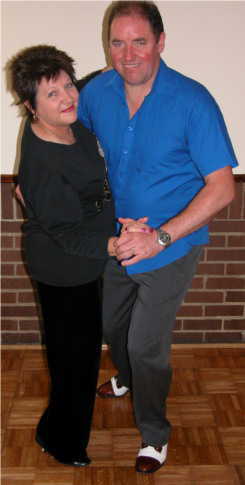 Sadly I lost both my lovely husband and my expert dancing & teaching partner in October 2010 when Dave died suddenly after a very short illness, but there are so many happy dancing memories for not only myself, but for the many, many people that have learnt to dance with us since 1996. In June 2013 I qualified as a Certified FitSteps Instructor, adding another dance dimension to the established classes, and I really enjoyed being one of the ‘pioneer’ instructors in this fabulous programme. I am now developing new crossover moves and extra dance content from the Ballroom & Latin world for my Strictly Dancercise classes. I hope learning to dance will give you as much pleasure as it's given us over the years - it really can change lives!